It’s always sensational when Miami chefs are recognized by The James Beard Foundation, and this time four Miami chefs are competing in their national blended burger contest. The James Beard Blended Burger Project™ is a movement that strives to make burgers better by blending ground meat (or other protein) with chopped mushrooms. Blended burgers are healthier for guests and more sustainable for the planet, and did we mention the blended burgers are absolutely delicious? La Muse is introducing the ERTHBURGER™, which is a guilt-free meatless burger that keeps our mother planet in mind by leaving a lighter footprint. Some of the goodness that makes up an Erth Burger™ includes mushrooms, tree nuts, sprouted grains, cheese, eggs and veggies. Don’t forget to order a side of fries! 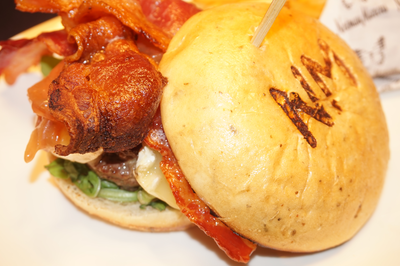 Next time you’re shopping at Neiman Marcus Coral Gables, be sure to visit Mariposa for its Triple Blend Burger, which features bison, beef and mushrooms. It’s so good you probably won’t even believe that there are mushrooms in the patty. If you’re looking for a blended burger on Miami Beach, Pubbelly Noodle Bar is the place to go! It's Umami Burger is a blend of wagyu, fresh shiitakes, dry shiitakes, soy, garlic, with tofu aioli, and gruyere cheese. Make sure to save room for dessert – the coco loco is a showstopper! Skorpios Miami is featuring the Ares burger served on a homemade sesame pita bun. The Ares burger features 50% Colorado grass fed ground Lamb, 25% ground sirloin steak, 25% finely chopped oven roasted brown Beech mushrooms, topped with aged melted Kefalograviera cheese, served on a bed of arugula, beefsteak tomatoes, Greek oregano, Turkish paprika, roasted garlic and topped with pickled red onions dressed with fresh parsley, mint, sumac, a touch of lemon juice and Greek sea salt.This burger comes plated on its own cutting board with a steak knife. The blender burger pairs perfectly with all of the new cocktails. Customers have until July 31 to vote online for their favorite blended burger and will be entered to win an expenses paid trip for two to the 2018 Blended Burger event at the James Beard House. In addition, a panel of food experts selected by the James Beard Foundation will determine five national winners from the top 20 entries with the most votes online. Experts including Andrew Zimmern (James Beard Award-winning TV personality), Susan Westmoreland (Culinary Director, Good Housekeeping), and Antoinette Bruno (CEO, StarChefs.com), will determine the top five winners based on (1) most creative use of mushrooms, (2) best flavor profile and (3) presentation. To learn more about the James Beard Foundation and the Blended Burger Project™ visit their website or click here to vote for your favorite Miami blended burger.